"Economical ground turkey takes well to a variety of flavors. Blended with different seasonings and quickly pan fried, it is an entree you can get to the table in minutes. 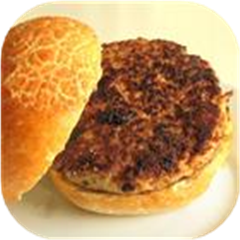 Serve on hamburger buns with lettuce and sliced tomatoes." In a large bowl, blend turkey with bread crumbs, egg, green onion, garlic, ginger and soy sauce. Shape into 4 patties. Heat oil in a wide skillet over medium heat. Cook burgers for 5 minutes on each side, or until cooked through. Garnish with chopped parsley.